Men's dress shoes (Derby type with open lacing). Men's dress shoes are most commonly black or brown. Cordovan or oxblood dress shoes are worn by men sometimes in the United States, while the other colors are worn by men of many nationalities. Men's shoes are often categorised by their fastening, and the various possibilities are listed below in roughly descending order of formality. Oxfords (British), or Balmorals (American), lace up and tie to keep them on the wearer's foot, and have a closed lacing, where the pieces of leather joined by the laces are sewn together at the bottom. Many Oxfords have an additional piece of leather sewn over the toe section, known as a toe cap. Oxfords are the standard shoe to wear with most suits. White Buck shoes are a variant of the oxford that are made of buckskin, and considered the companion to seersucker and other summer suit fabrics. 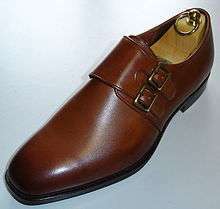 A monk shoe (also called a monkstrap) has no lacing, and is closed by a strap with a buckle. Monk shoes are typically regarded as less formal; they are often considered appropriate for business formal, but rarely appropriate with any kind of formal attire. Derbies, or Blüchers in America, are similar to Oxfords, but have open lacing. They are a little less formal, and are often worn in brown, with some brogueing. Loafers, or slip-ons, come in both men's and women's styles. It is not unusual for a man's loafer to have a tassel, although this can be seen in women's varieties too. Loafers were originally men's shoes, and are usually thought of as such, although women do now wear them. In addition to the above, there are various less common types of footwear to accompany formalwear, such as the court shoe (also called opera shoe, or patent pumps) for eveningwear and the dress boot for daywear. They may also match the color of the gown, dress or suit being worn. Pumps come in a variety of colors and styles. They can have a rounded or pointed toe, and are usually made of leather. They have a heel of at least 5 cm (2 inches). Today, pumps have evolved beyond the classic working woman's shoe. Now, there are peep toe pumps, which have a small opening at the toes. There are also pumps with ankle straps. Not only have the styles evolved, the fabrics have as well. While almost all pumps used to be made of leather, pumps now come in a variety of materials, such as suede and wool. The slingback is similar to the pump in that it can have a rounded or pointed toe and usually has a heel, but it doesn't wrap all the way around the heel like pumps usually do. Instead, it has a narrow strap that is pulled up over the heel, leaving the rest of the heel exposed. Loafers are usually flat and typically thought of as both more masculine and comfortable than anything with a heel. The typical loafer has a round toe, and comes in darker colors, such as black or brown. A spin on the loafer is the cloak, which, like the loafer, is a slip-on shoe, but it has a heel and is considered a more effeminate design. Mules are shoes that slide onto the foot, and do not cover the heel or the back of the foot at all. These aren't considered dress shoes unless they have a heel. The ballet flat hadn't been a popular fashion trend until some time after the first few years of the 21st century. Taken from the art of ballet, as their name implies, they are flat shoes with a rounded toe, and come in many different colors and patterns. The classic ballet flat has a small bow on the toe, but this style has evolved to include varieties without bows. While sandals are usually more casual, there are some sandals that can be worn with dress clothes. For example, any sandal that has a heel, many straps, or a shiny finish would probably be acceptable in a more formal atmosphere. A minor controversy erupted in 2005 when some members of Northwestern University's national champion women's lacrosse team visited the White House wearing flip-flops. Following the criticism, their footwear was eventually auctioned off on eBay to raise money for a young cancer patient, Jaclyn Murphy of Hopewell Junction, New York, who was befriended by the team. Nine pairs of flip-flops raised approximately $1,653. There is still a debate over whether this signaled a fundamental change in American culture — many youth feel that flip-flops are more dressy and can be worn in a variety of social contexts, while older generations feel that wearing them at formal occasions signifies laziness and comfort over style. The Dalai Lama of Tibet is also a frequent wearer of flip-flop sandals and has met with several US presidents, including George W. Bush and Barack Obama, while wearing the sandals. ↑ Ward, Julie (September 13, 2005). "Next big step in team spirit: Flip-flops.". USA Today. Retrieved July 19, 2012. ↑ DeMello, Margo (2009). Feet and Footwear: A Cultural Encyclopedia. Santa Barbara, California: ABC-CLIO, LLC. pp. 130–131. ISBN 978-0-313-35714-5. ↑ Lister, Richard (February 19, 2010). "Flip-flop diplomacy with the Dalai Lama.". BBC News. Retrieved July 19, 2012.